Though delicious now, this blend will continue to integrate and evolve with additional bottle aging. If enjoyed before 2017, please decant at least 30 minutes before serving. 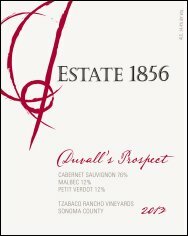 Food Pairing Suggestion: Enjoy the 2013 Duvall’s Prospect with Roasted Prime Rib with a Horseradish Crust served with Scalloped Potato Gratin and Roasted Red Onions with butter, honey and balsamic vinegar.